"Puffed corn can be found in the potato chip aisle of your grocery store. This is a great caramel corn without hulls or unpopped kernels. Warning: you need to make a double batch of this because it doesn't last long, at least not in my house. Very addicting. Love it!" 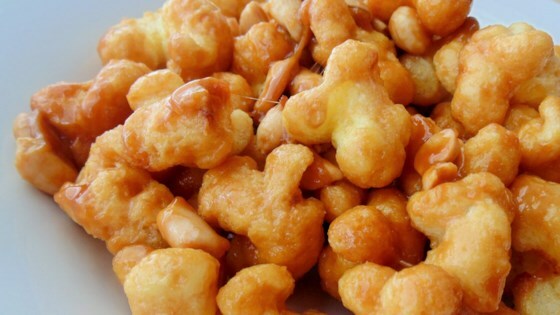 Combine corn puffs and peanuts in a large roasting pan. Bring butter, brown sugar, and corn syrup to a boil in a heavy 2-quart saucepan. Cook and stir for 2 minutes. Remove from heat; stir in baking soda until mixture foams up. Pour over corn-peanut mixture and toss well using rubber spatulas. Bake in the preheated oven, stirring every 10 to 15 minutes, until a cooled piece of corn is crunchy, about 45 minutes. Spread on waxed paper to cool. Break apart and transfer to an airtight container. Caramel corn is hot. Please handle carefully. Use utensils. I left out the peanuts and added a teaspoon of vanilla. Turned out awesome and everyone loved it. This will definitely be made again and be a family favorite. Might need to be in the oven a little longer than recipe calls for. A roaster pan is great for this.